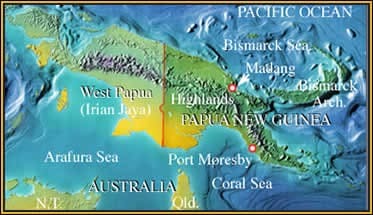 Location: Highlands and Madang Provinces, Papua New Guinea. Papua New Guinea is often billed as ‘The Land of the Unexpected’ and it is certainly that. Five small species of skinks with green blood are found here, the only green-blooded land vertebrates in the world. But why would these small inoffensive lizards evolve green blood? In 1968 research into the blood of green-blooded skinks determined that the colouration was due to the presence of a biliverdin-type pigment, like that found in bile. Mark has a theory that this may make the lizards taste bitter and deter predators, a once tried, never repeated experience for lizard-eating birds. Dr Chris Austin is the only scientist in the world currently studying green-blooded skinks and he has an alternative theory, one that if correct, might lead to a cure for human diseases like jaundice, or even malaria. Mark and Chris set out to scour the mountains and WWII wreck strewn jungles of PNG in an attempt to locate three of the five known green-blooded skink species and obtain blood samples for analysis. But whose theory is closest to the truth? 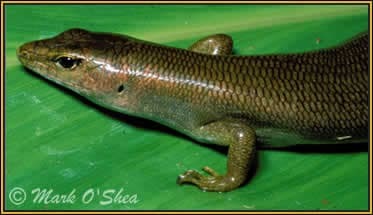 The Yellow-footed green-blooded skink, (Prasinohaema flavipes), is the largest and probably most widespread member of the genus Prasinohaema.